A choir, chorale, or chorus is a musical ensemble of singers. A body of singers who perform together is called a choir or chorus. The former term is very often applied to groups affiliated with a church (whether or not they actually occupy the quire) and the second to groups that perform in theaters or concert halls, but this distinction is far from rigid. "Choir" has the secondary definition of a subset of an ensemble; thus one speaks of the "woodwind choir" of an orchestra, or different "choirs" of voices and/or instruments in a polychoral composition. In typical eighteenth to twentieth century oratorios and masses, chorus or choir is usually understood to imply more than one singer per part, in contrast to the quartet of soloists also featured in these works. 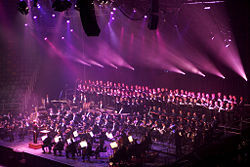 Choirs are often led by a conductor or choirmaster. Most often choirs consist of four parts but there is no limit to the number of possible parts: Thomas Tallis wrote a 40-part motet entitled Spem in alium, for eight choirs of five parts each; Krzysztof Penderecki's Stabat Mater is for three choirs of 16 voices each, a total of 48 parts. Other than four, the most common number of parts are three, five, six and eight. Choirs can sing with or without instrumental accompaniment. Singing without accompaniment is called a cappella singing (although the American Choral Directors Association discourages this usage in favor of "unaccompanied"). Accompanying instruments can consist of practically any instruments, from one to a full orchestra; for rehearsals a piano or organ accompaniment is often used even if a different instrumentation is planned for performance, or for rehearsing a cappella music. While Eastern Orthodox churches and some synagogues ban the use of instruments, in churches of the western rite the accompanying instrument is almost always an organ. Beside leading the singing of the congregation participates such as hymns and service music, choirs still sing the full propers (introit, gradual, communion antiphons appropriate for the different times of the liturgical year) at a few churches, chiefly those of the Anglican or Roman Catholic churches. Far more common, however, is the performance of an anthem at the offertory. The Vatican conducts all of its Masses in Latin, and its choir mainly made up of religious clergy. They sing a repertory of Latin Chants known as Gregorian Chant. Local Roman Catholic Churches also use at their discretion to have additional orchestral accompaniment. The most noted Roman Catholic Church in the world to use an orchestral accompaniment is Saint Patrick's Cathedral in New York City. Mixed choirs (i.e., with male and female voices). This is perhaps the most common type, usually consisting of soprano, alto, tenor and bass voices, often abbreviated as SATB. Often one or more voices is divided into two, e.g., SSAATTBB, where each voice is divided into two parts, and SATBSATB, where the choir is divided into two semi-independent four-part choirs. Occasionally baritone voice is also used (e.g., SATBarB), often sung by the higher basses. Male choirs, with the same SATB voicing as mixed choirs, but with boys singing the upper part (often called treble or boy soprano) and men singing alto (in falsetto), also known as countertenor. This format is typical of the British cathedral choir. Men's choirs, usually consisting of two tenors, baritone, and bass, often abbreviated as TTBB (or ATBB if the upper part sings falsetto in alto range like barbershop music, even though this notation is not normally used in barbershop music). Occasionally, a men's choir will have Basso Profundo, the lowest of all male vocal ranges. Children's choirs, often two-part SA or three-part SSA, sometimes more voices. There are various schools of thought regarding how the various sections should be arranged on stage. In symphonic choirs it is common (though by no means universal) to order the choir from highest to lowest voices from left to right, corresponding to the typical string layout. In a cappella or piano-accompanied situations it is not unusual for the men to be in the back and the women in front; some conductors prefer to place the basses behind the sopranos, arguing that the outer voices need to tune to each other. More experienced choirs often sing with the voices all mixed together. Proponents of this method argue that it makes it easier for each individual singer to hear and tune to the other parts, but it requires more independence from each singer. Opponents argue that this method loses the spatial separation of individual voice lines, an otherwise valuable feature for the audience, and that it eliminates sectional resonance, which lessens the effective volume of the chorus. For music with double (or multiple) choirs, usually the members of each choir are together, sometimes significantly separated, especially in performances of sixteenth-century music. Some composers actually specify that choirs should be separated, such as in Benjamin Britten's War Requiem. to monitor one's own singing and detect errors. to sing music in keys other than that in which it is written, since choirs often sing music in transposed form. The earliest notated music of western Europe is Gregorian Chant, along with a few other types of chant which were later subsumed (or sometimes suppressed) by the Catholic Church. This tradition of unison choir singing lasted from sometime between the times of St. Ambrose (fourth century) and Gregory the Great (sixth century) up to the present. 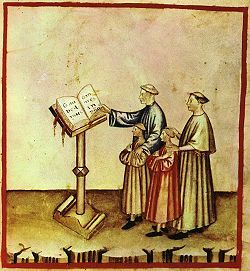 During the later Middle Ages, a new type of singing involving multiple melodic parts, called organum, became predominant for certain functions, but initially this polyphony was only sung by soloists. Further developments of this technique included clausulae, conductus and the motet (most notably the isorhythmic motet), which, unlike the Renaissance motet, describes a composition with different texts sung simultaniously in different voices. The first evidence of polyphony with more than one singer per part comes in the Old Hall Manuscript (1420, though containing music from the late 1300s), in which there is occasional divisi (where one part divides into two different notes, something a solo singer obviously couldn't handle). During the Renaissance, sacred choral music was the principal type of (formal or "serious") music in Western Europe. Throughout the era, hundreds of masses and motets (as well as various other forms) were composed for a cappella choir, though there is some dispute over the role of instruments during certain periods and in certain areas. Some of the better-known composers of this time include Dufay, Josquin des Prez, Giovanni Pierluigi da Palestrina, and William Byrd; the glories of Renaissance polyphony were choral, sung by choirs of great skill and distinction all over Europe. Choral music from this period continues to be popular with many choirs throughout the world today. Madrigals are another particularly popular form dating from this period. Although madrigals were initially dramatic settings of unrequited-love poetry or mythological stories in Italy, they were imported into England and merged with the more upbeat balletto, celebrating often silly songs of spring, or eating and drinking. To most English speakers, the word madrigal now refers to the latter, rather than to madrigals proper, which refers to a poetic form of lines consisting of seven and 11 syllables each. The interaction of sung voices in Renaissance polyphony influenced Western music for centuries. Composers are routinely trained in the "Palestrina style" to this day, especially as codified by the 18c music theorist Johann Joseph Fux. Composers of the early twentieth century also endeavored to extend and develop the Renaissance styles. Herbert Howells wrote a Mass in the Dorian mode entirely in strict Renaissance style, and Ralph Vaughan Williams's Mass in G minor is an extension of this style. Anton von Webern wrote his dissertation on the Choralis Constantinus of Heinrich Isaac and the contrapuntal techniques of his serial music seems informed by this study. The sudden developments which mark the beginning of the Baroque period around 1600 (instrumental music, opera, chords) were only introduced gradually into choral music. Madrigals continued to be written for the first few decades of the seventeenth century. Contrapuntal motets continued to be written for the Catholic Church in the Renaissance style well into the eighteenth century. One of the first innovative choral composers of the Baroque was Claudio Monteverdi (1567-1643), a master of counterpoint, who extended the new techniques pioneered by the Venetian School and the Florentine Camerata. Monteverdi, together with Heinrich Schütz (1585-1672), used the new harmonic techniques to support and reinforce the meaning of the text. They both composed a large amount of music for both a cappella choir as well as choirs accompanied by different ensembles. Independent instrumental accompaniment opened up new possibilities for choral music. Verse anthems alternated accompanied solos with choral sections; the best-known composers of this genre were Orlando Gibbons and Henry Purcell. Grand motets (such as those of Michel-Richard Delalande) separated these sections into separate movements. Oratorios extended this concept into concert-length works, usually loosely based on Biblical stories. Giacomo Carissimi was the principal early composer of oratorios, but most opera composers of the Baroque also wrote oratorios, generally in the same musical style as the operas. George Frideric Handel is the best-known composer of Baroque oratorios, most notably Messiah and Israel in Egypt. Lutheran composers wrote instrumentally-accompanied cantatas, often based on chorales (hymns). While Dieterich Buxtehude was a significant composer of such works, Johann Sebastian Bach (1685-1750) made the most prominent mark in this style, writing cantatas, motets, passions and other music. While Bach was little-known as a composer in his time, and for almost a century after his death, composers such as Mozart and Mendelssohn assiduously studied and learned from his contrapuntal and harmonic techniques, and his music is regularly performed and admired in the present day. Composers of the late eighteenth century became fascinated with the new possibilities of the symphony and other instrumental music, and generally neglected choral music. Mozart's choral music generally does not represent his best work, with a few exceptions (such as the "Great" Mass in C minor and Requiem in D minor). Haydn only became interested in choral music near the end of his life following his visits to England in the 1790s, when he heard various Handel oratorios performed by large forces; he wrote a series of masses beginning in 1797 and his two great oratorios The Creation and The Seasons. Beethoven wrote only two masses, both intended for liturgical use, although his Missa solemnis is suitable only for the grandest ceremonies. He also pioneered the use of chorus as part of symphonic texture with his Ninth Symphony. In the nineteenth century, sacred music escaped from the church and leaped onto the concert stage, with large sacred works unsuitable for church use, such as Berlioz's Te Deum and Requiem, and Brahms's Ein deutsches Requiem. Rossini's Stabat mater, Schubert's masses, and Verdi's Requiem also exploited the grandeur offered by instrumental accompaniment. Oratorios also continued to be written, clearly influenced by Handel's models. Berlioz's L'Enfance du Christ and Mendelssohn's Elijah and St Paul are in the category. Schubert, Mendelssohn, and Brahms also wrote secular cantatas, the best known of which are Brahms's Schicksalslied and Nänie. A few composers developed a cappella music, especially Bruckner, whose masses and motets startlingly juxtapose Renaissance counterpoint with chromatic harmony. Mendelssohn and Brahms also wrote significant a cappella motets. The amateur chorus (beginning chiefly as a social outlet) began to receive serious consideration as a compositional venue for the part-songs of Schubert, Schumann, Mendelssohn, Brahms, and others. These "singing clubs" were often for women or men separately, and the music was typically in four-part (hence the name "part-song") and either a cappella or with simple instrumentation. At the same time, the Cecilian movement attempted a restoration of the pure Renaissance style in Catholic churches. As in other genres of music, choral music underwent a period of experimentation and development during the twentieth century. While few well-known composers focused primarily on choral music, most significant composers of the early century wrote at least a small amount. The early post-Romantic composers, such as Richard Strauss and Sergei Rachmaninoff, contributed to the genre, but it was Ralph Vaughan Williams who made the greatest contribution of this type, writing new motets in the Renaissance style with the new harmonic languages, and arranging English and Scottish folk songs. Arnold Schoenberg's Friede auf Erden represents the culmination of this style, a tonal kaleidoscope whose tonal centers are constantly shifting (similar to his Verklärte Nacht for strings dating from the same period). At around this time, at the tail end of the nineteenth century and the start of the twentieth, male voice choirs attained a particular popularity amongst the coal miners of South Wales, with numerous choirs being established at this time, such as the Treorchy Male Choir. Although the mining communities which birthed these choirs largely died out in the 1970s and 1980s with the decline of the Welsh coal industry, many of these choirs have gone from strength to strength and are seen as a 'traditional' part of Welsh culture. As the century progressed, modernist techniques found their expression in choral music, including serial compositions by Schoenberg, Anton von Webern, and Stravinsky; eclectic compositions by Charles Ives; dissonant counterpoint by Olivier Messiaen (Cinq Rechants) and Paul Hindemith (When Lilacs Last in the Dooryard Bloom'd). Because of the difficulty of singing atonal music, these compositions are rarely performed today, although enjoyed by specialists. More accessible styles found an enduring legacy in choral music. Benjamin Britten wrote a number of well-known choral works, including the War Requiem, Five Flower Songs, and Rejoice in the Lamb. Francis Poulenc's Motets pour le temps de noël, Gloria, and Mass in G are often performed. A primitivist approach is represented by Carl Orff's widely performed Carmina Burana. In the United States, Aaron Copland, Samuel Barber, and Randall Thompson wrote signature American pieces. In Eastern Europe, Béla Bartók and Zoltán Kodály wrote a small amount of choral music. Post-World War II music took experimentation to its logical extreme. Sinfonia by Luciano Berio includes a chorus. Krzysztof Penderecki's St. Luke Passion includes choral shouting, clusters, and aleatoric techniques. Richard Felciano wrote for chorus and electronic tape. Minimalism is represented by Arvo Pärt, whose Johannespassion and Magnificat have received regular performances. Wordless chorus, spearheaded by Tchaikovsky's The Nutcracker and Holst's The Planets, was expanded by Schoenberg, Darius Milhaud, and others. Multiple choirs (two or more choral works performed simultaneously, such as in works by Evgeni Kostitsyn). Black Spirituals came into greater prominence and arrangements of such spirituals became part of the standard choral repertoire. Notable composers and arrangers of choral music in this tradition include Jester Hairston and Moses Hogan. During the mid twentieth century, barbershop quartets began experimenting with combining larger ensembles together into choruses which sing barbershop music in 4 parts, often with staging, choreography and costumes. The first international barbershop chorus contest was held in 1953 and continues to this day, the most recent one being held in Denver, CO, with the Westminster Chorus winning the gold medal. During the late twentieth century, one of the major areas of growth in the choral movement has been in the areas of GLBT choruses. Starting around 1979, gay men's choruses were founded within a period of months in major U.S. cities such as New York, Los Angeles, Seattle, and Dallas. Over the last quarter century the number of such groups, men's, women's, and mixed, has exploded. GALA Choruses, an associative group, now has well-over 100 member choruses throughout the world. At the turn of the century, choirs and choral music have received a resurgence of interest due in no small part to a renewed emphasis and interest in multi-cultural music. Ethnomusicology often focuses on vocal music because of the unique combination of both text and music. Although it is too soon to discern trends in the twenty-first century, the spirit of more practical music which dominated the last decades of the twentieth century, most notably represented by John Rutter, Karl Jenkins, and Morten Lauridsen, seems to be continuing in the works of composers like Eric Whitacre and Kentaro Sato. All links retrieved February 16, 2017. This page was last modified on 16 February 2017, at 23:01.